One black haircloth parlor set consisting of one sofa, 4 chairs, two easy chairs, one cloth covered; one centre table, one organ, one pine chamber set, one lounge, one ash writing desk with drawers, one extension table six chairs, two featherbeds, two mattresses, two rag carpets and one manila carpet. Also all the dishes and all other furniture in said house belonging to me. And I hereby put the said Evelyn Higgins in possession and ownership of said property by delivering her this indenture. 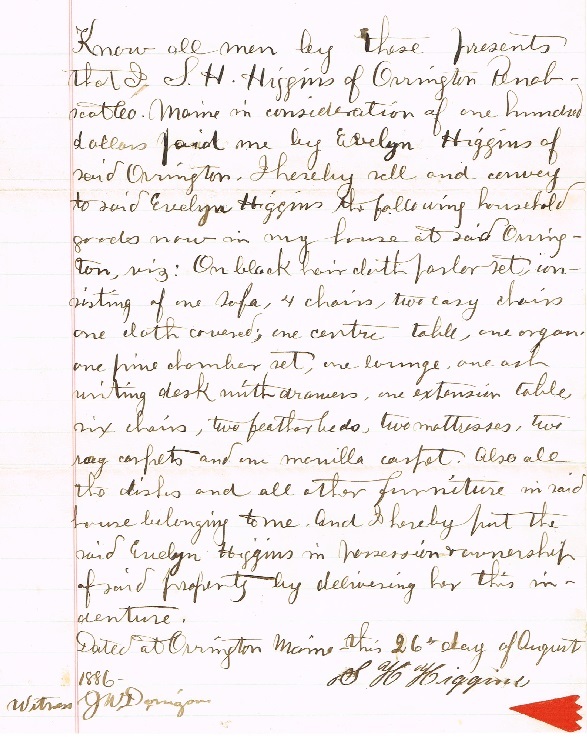 Dated at Orrington Maine this 26th day of August, 1886.